Easily connects to an alarm panel and automatically dials out when activated. Two independent voice messages. 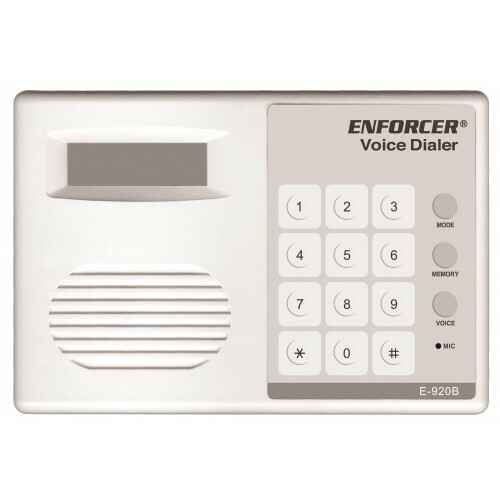 Stores up to four telephone numbers, cellular numbers or pager numbers. Delivers a message of up to 16 seconds to each number stored. Instant trigger or exit and entry delay settings. Repeats the voice message for one minute per call. Waits 8 to 10 rings before dialing the next programmed number. Calls two times when there is no answer or three times when the line is busy. EEPROM retains memory if power is lost for up to one year. Optional 9-Volt internal battery provides standby power for approximately two to three days. Can be used worldwide due to Universal Dial Tone. Can be used with PBX and regular telephone systems.